It'll keep what's left of your bunch perky for longer—we tried it, and our herbs lasted for over a week. A bunch of fresh herbs tastes best, but what do you do when it's way more than what your recipe calls for? (We're looking at you, guacamole cilantro). 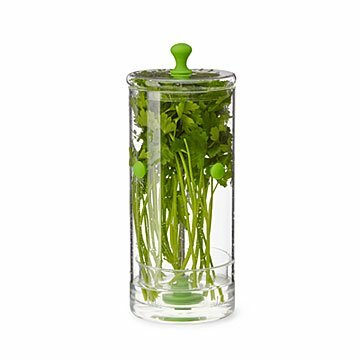 Snip off what you need, then put the rest in this glass herb keeper. It'll keep what's left perky for longer—we tried it, and our herbs lasted for over a week. Make pesto now and a Caprese salad later, because basil's got a brand new bag. Or garnish Monday's potatoes with parsley, and save the rest for Saturday morning quiche. However you herb, this design is your new defense against the droop. Made in China.